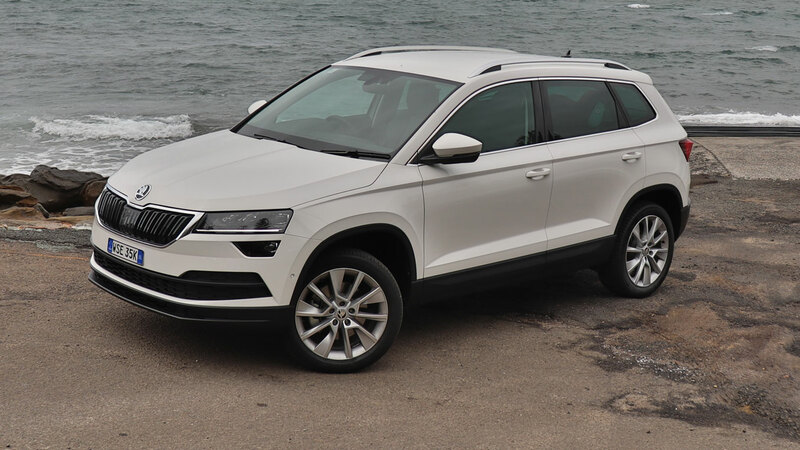 A fantastic little SUV with some great Skoda features! Skoda does not disappoint with their new small SUV, the Karoq, which has a boot full of wonderful BabyDrive features! My all-time favourite is the retractable roller blind that stays clipped to the boot door so that when it is in the open position the roller blind is well out of the way while you are loading up. My second favourite boot feature is the chunky hooks on both sides of the boot that I could hang my little girls' lunch box and backpack on, to and from daycare drop-offs. Closely followed by the rubber boot floor mat that I have already wiped down twice!! The boot capacity was average and they had definitely stolen space from the cabin's legroom. 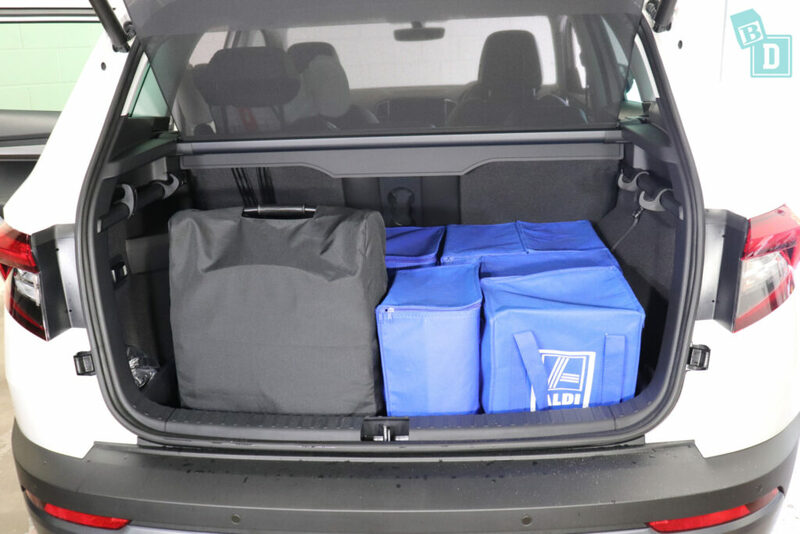 The boot of the Karoq would hold eleven shopping bags, the same as the Nissan Qashqai and Suzuki Vitara. 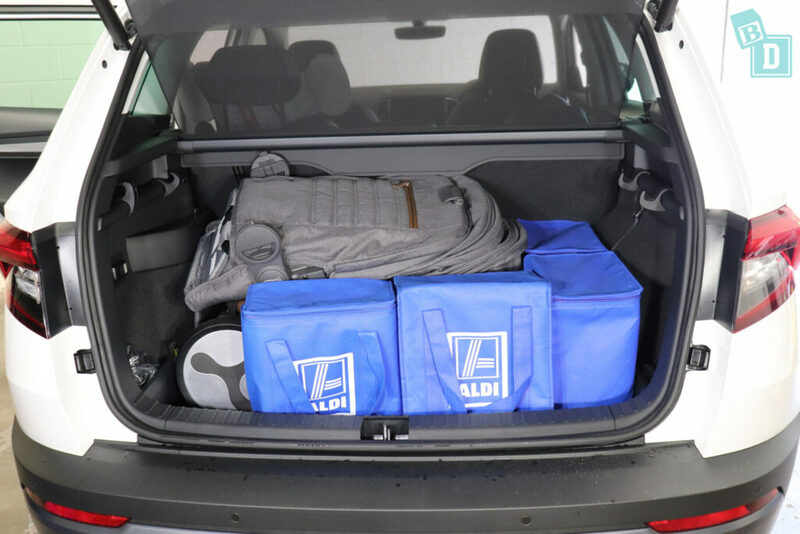 The Suzuki S-Cross and VW Tiguan both held 12, in comparison to the Mitsubishi Eclipse Cross that held 10 shopping bags. 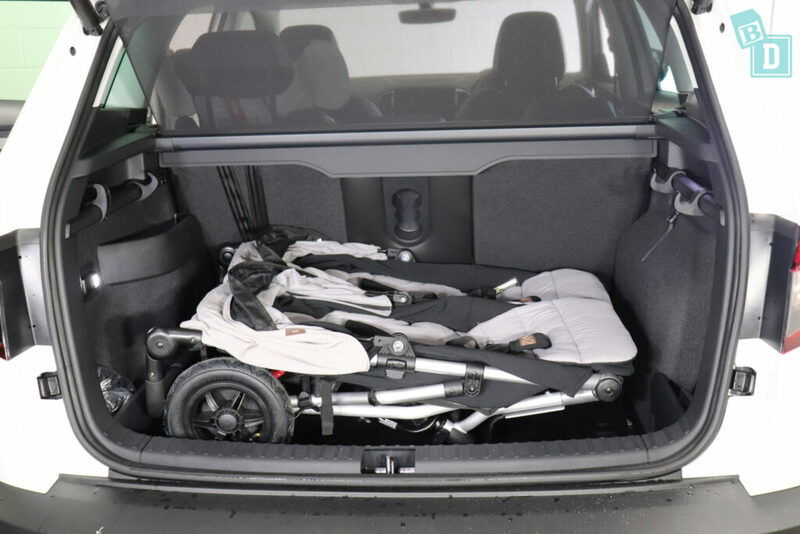 The Karoq boot held all styles of stroller I tested but the biggest, the Mountain Buggy Duet twin stroller, filled the boot and no bags would fit in with it, which means you'd need to load them in on top of the twin stroller. The exterior of the Karoq looked a lot like the VW Tiguan at first glance but is, in fact, 10cm shorter in length and that is noticeable in the legroom for front passengers when child seats are installed in the rear seats. We did manage to get a 6ft passenger in the front passenger seat in front of a rear-facing capsule and they had about 18cm of knee room. I managed to fit two child seats in the back of the Karoq, but there just wasn't room for a third. The IsoFix points in the two outer seats are within plastic guides and really easy to connect to, and the top tethers are big bars along the bottom of the seatbacks that are easy to connect to through the boot, although they are so low that I did need an extension strap with the rear facing child seat. The top tether bars are part of an elaborate seat folding system that looks more complicated than it is. 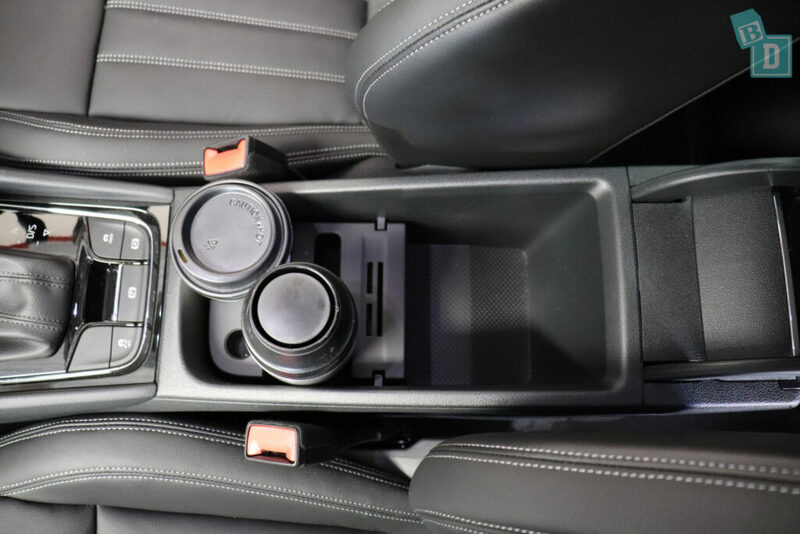 Storage was quite compact in the cabin of the Karoq too; the central console box was half storage, and the front contained two cup holders which would hold a disposable or re-usable coffee cup but were too small for anything else. Among these were some coin and card slots, a lipstick holder and a key slot. There was a convenient well in front of the gear lever for wireless charging and there are USB and 12V sockets there too. 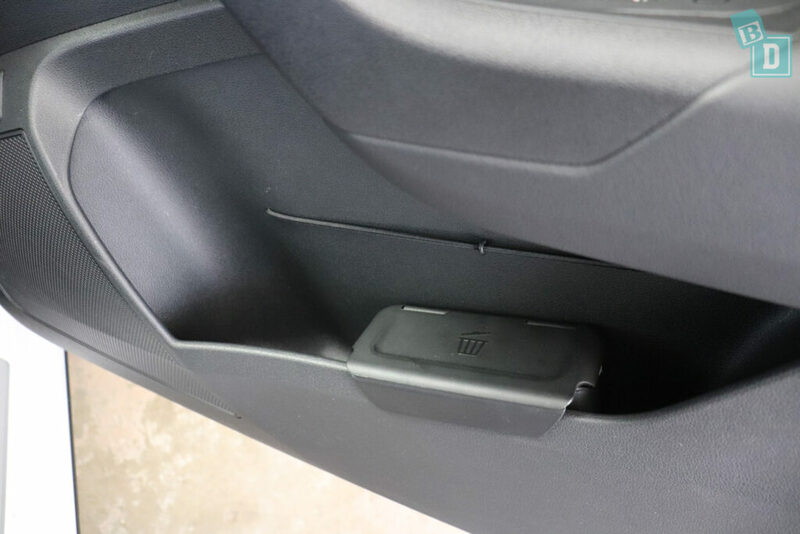 The glove box was not very big, so I could only get my wallet in there with the manual but it does also double as a coolbox with a little dial in there to allow cool air in. In the back storage was minimal as well. 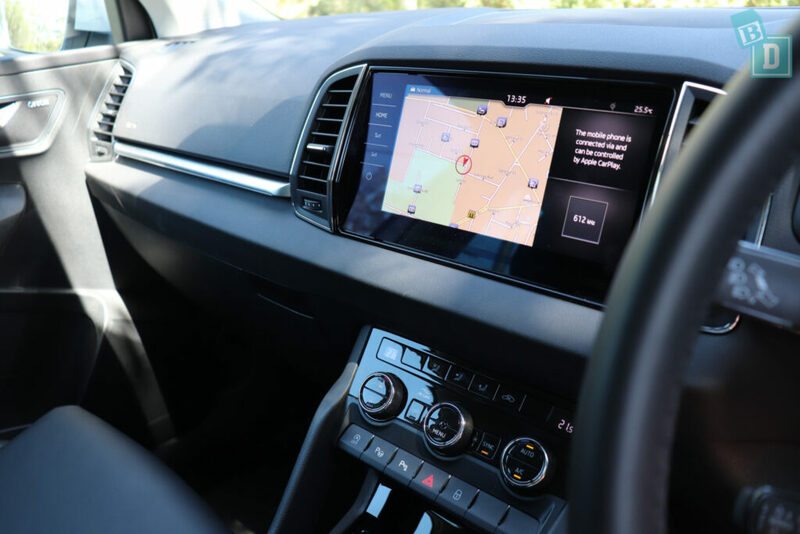 The media system in the Karoq is excellent, it has a large and clear screen with modern and easy to use graphics, as well as Apple CarPlay and Android Auto. The Karoq has park pilot with great camera visuals and the sat-nav is easily navigated and the announcements easily muted too. 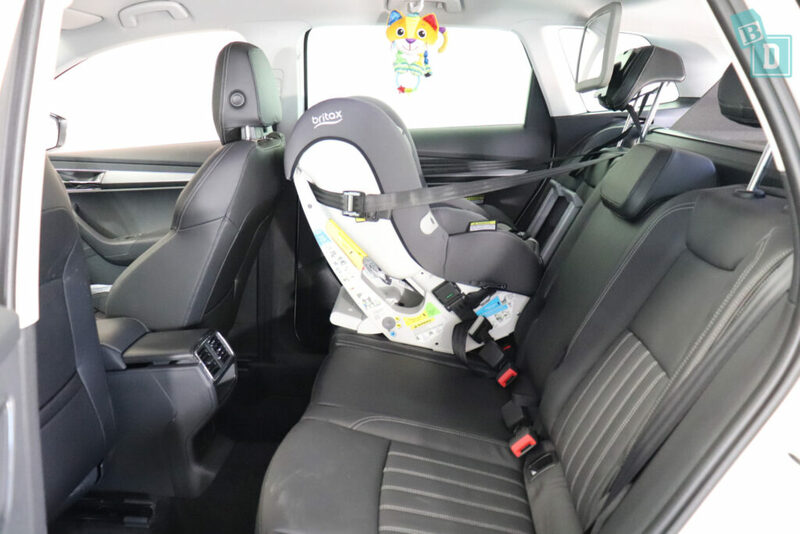 Overall the new Karoq is a great BabyDrive, the legroom is a consideration if you are a tall family but it would be a great family of four SUV. The Skoda Karoq was given a five-star Euro NCAP safety rating in 2017 and has seven airbags as standard. 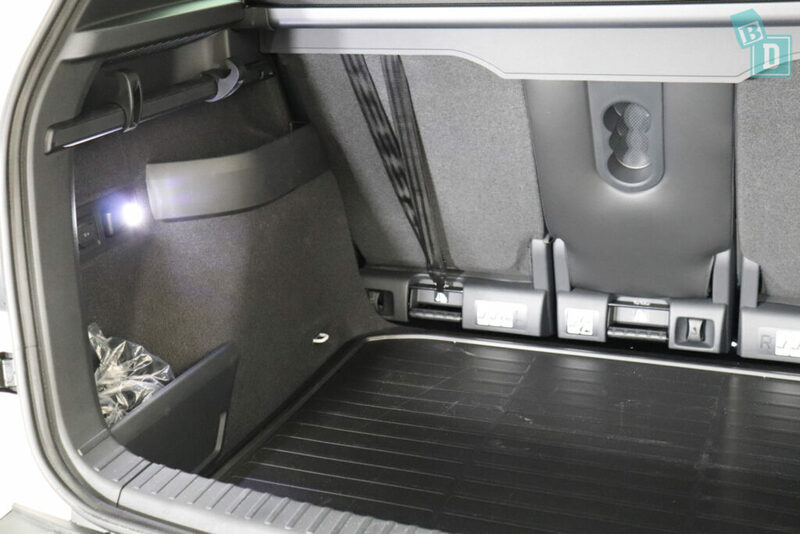 How big is the boot of the new Skoda Karoq? 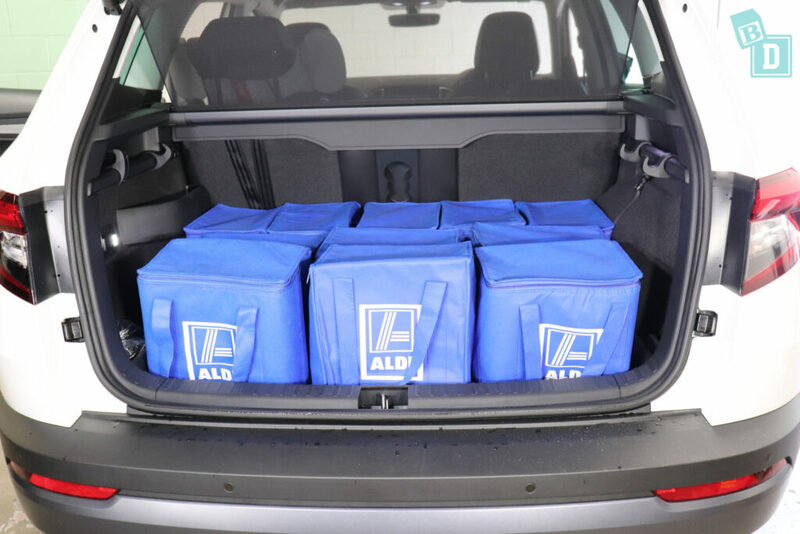 From empty, I could fit 11 shopping bags in the boot, the same as the Nissan Qashqai and Suzuki Vitara. 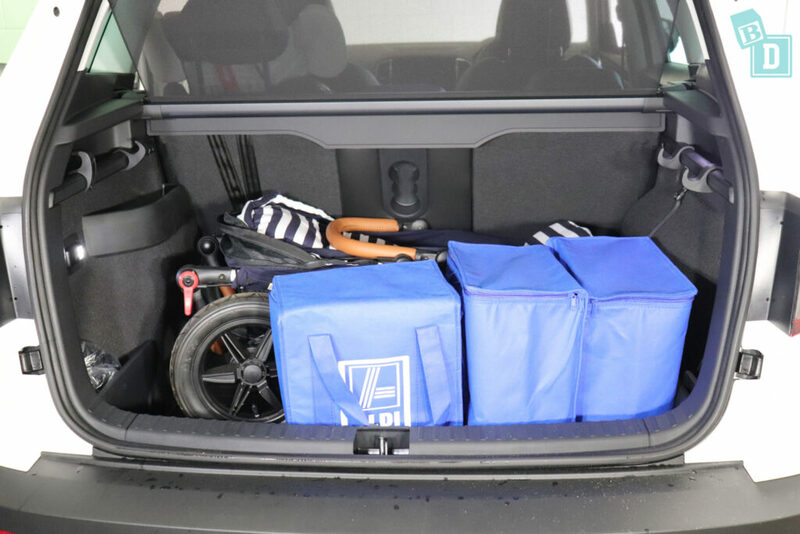 It holds one less bag than the Suzuki S-Cross and VW Tiguan which both held 12 in comparison and one more than the Mitsubishi Eclipse Cross that held 10 shopping bags. The Mountain Buggy Duet twin stroller fitted in the boot but no shopping bags would fit beside it. The Britax Flexx tandem stroller fitted with four shopping bags beside it. The Mountain Buggy Nano compact stroller fitted with nine shopping bags beside it. Or you could fit a medium sized dog in the boot if you remove the retractable roller blind. The boot of the Karoq is full of great BabyDrive features. There is a waterproof rubber mat on the floor that is easy to take out and hose clean. On the left side of the boot, there is a removable torch and a cargo net and storage compartment behind the wheel arch as well as two chunky hooks that I found really helpful and practical to hang bags onto. 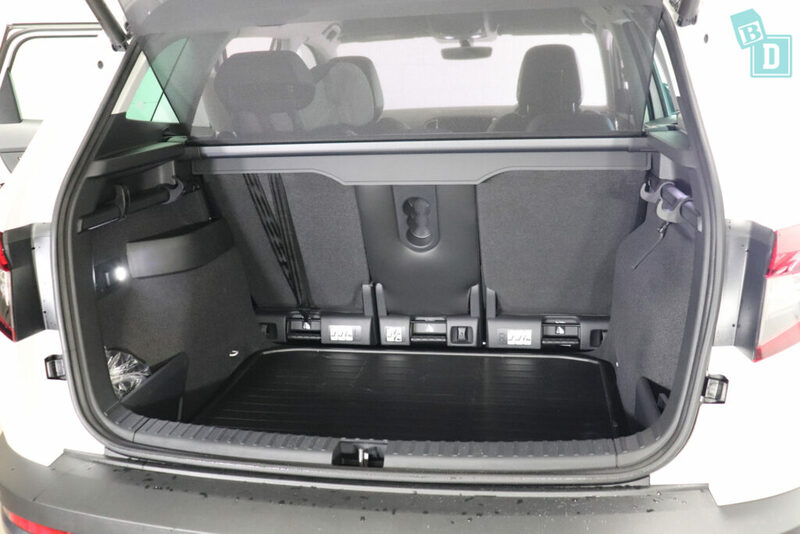 On the right-hand side of the boot, there are two hooks as well, the same storage compartment behind the wheel arch and some dividers you can stick to the carpeted floor, underneath the rubber floor mat, to compartmentalise the boot and hold fragile things in position. The boot floor is nice and flat and a good spot for an emergency nappy change! 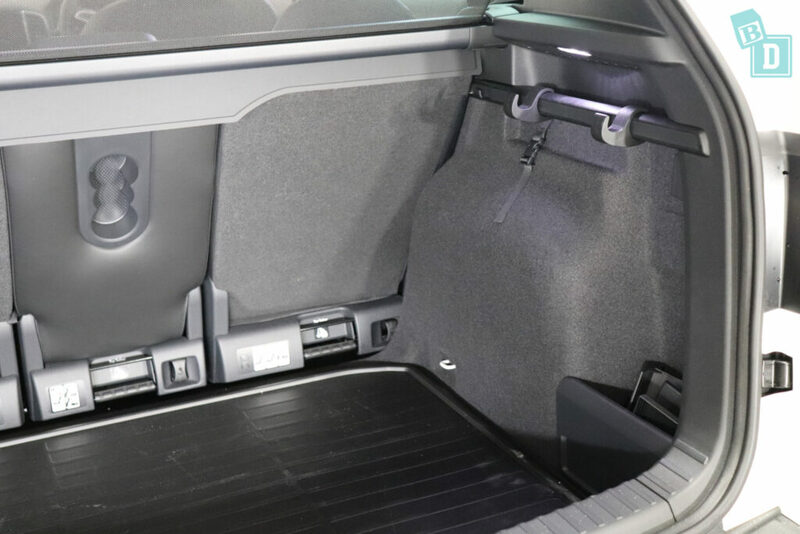 My favourite BabyDrive friendly boot feature is the retractable roller blind, which connects onto the boot door and stays up in the air when you open the boot, so it doesn't get in your way when loading and unloading the boot. On the back of the roller-blind, there is a flap that covers the gap between the roller-blind and the car seat backs that you can post the top tether strap through when installing child seats. Storage in the cabin was compact and functional. The front door bins would hold a large refillable water bottle and had an elastic strung across it that I found useful for holding an iPad in place. 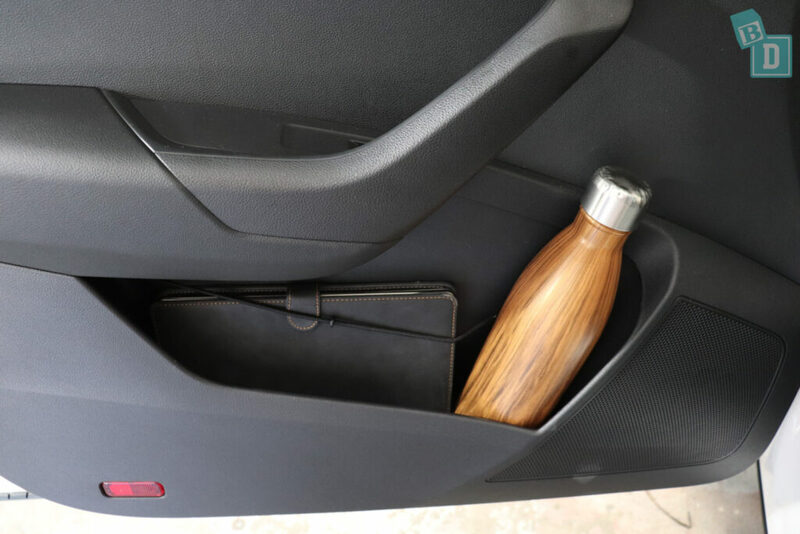 In the driver's door pocket there is a little waste bin that is a nice feature. I like to think I would use this and my car would be child rubbish free but I'm sure the reality would be it would still end up a usual family car! The central console storage box lid doubles as an armrest. It's split into halves: There is a storage box at the back and the other half has two cup holders. These are small and will hold a reusable or disposable coffee cup but nothing bigger and there is not much space for them. There is also two coin slots and a cardholder, another slot for a lipstick and a key slot. The whole organiser is removable and then the central console box is much bigger. 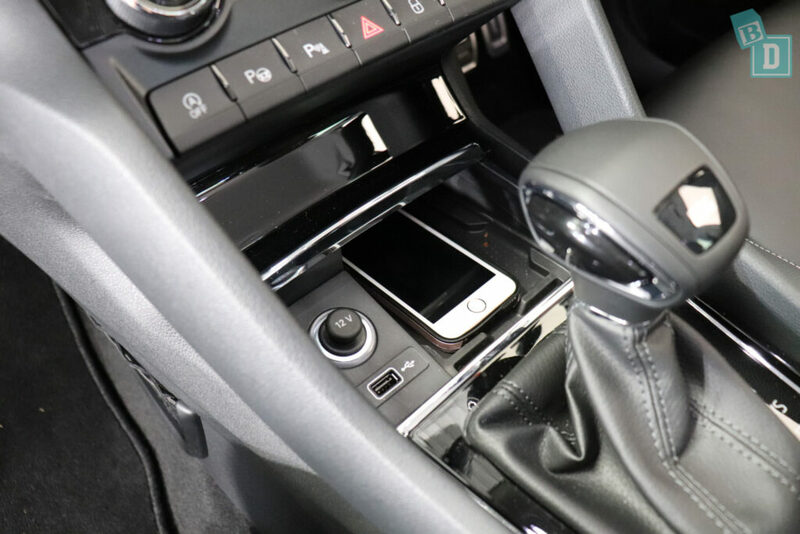 In front of the gear lever are a phone charging tray that you can pull a cover over, it also has a USB and 12V socket for charging. There is also a small net on the left side of the central console. The glove box is not very big in the Karoq. It would hold my wallet but my iPad wouldn't fit with the manual in there too. There is a dial for cooling to the glove box, useful for putting snacks in on journeys. The doors do not have little storage wells in them which always frustrates me. I find them really useful for putting keys or whatever my daughter has in her hands when I am loading her into the car. 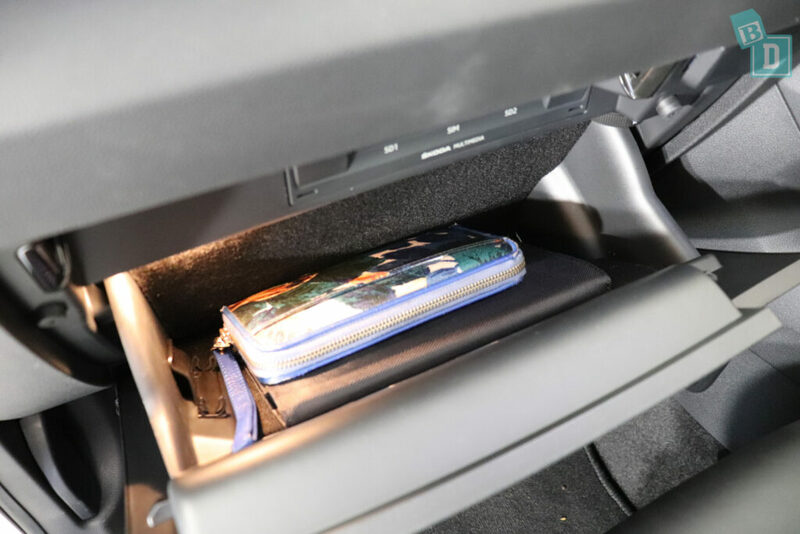 In the back of the Karoq's front seats, there are map pockets they are quite small, so they will hold an iPad but not conceal them. The central seatback folds forward and you can see through to the boot. 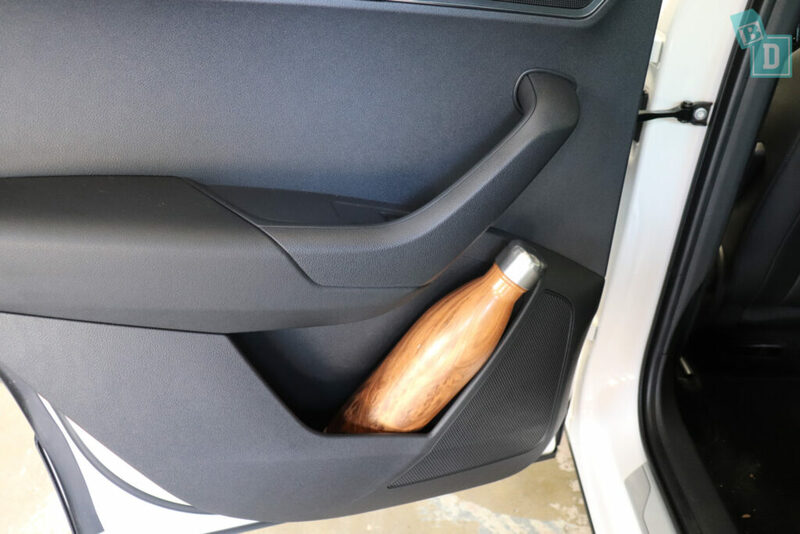 There are two cup holders in the back of the seat back; they will hold re-usable or disposable coffee cups or a 600ml bottle. 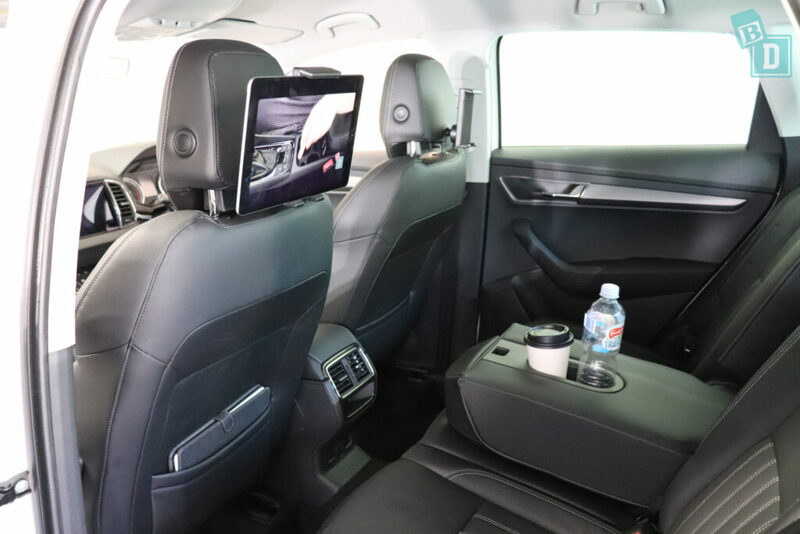 There are also tablet holders attached to both front headrests, so you can put a phone or tablet in them and keep rear passengers entertained. There is a 12V socket in the back of the central console box which would be handy for charging. How noisy is the new Skoda Karoq? The media system in the Skoda Karoq is great! 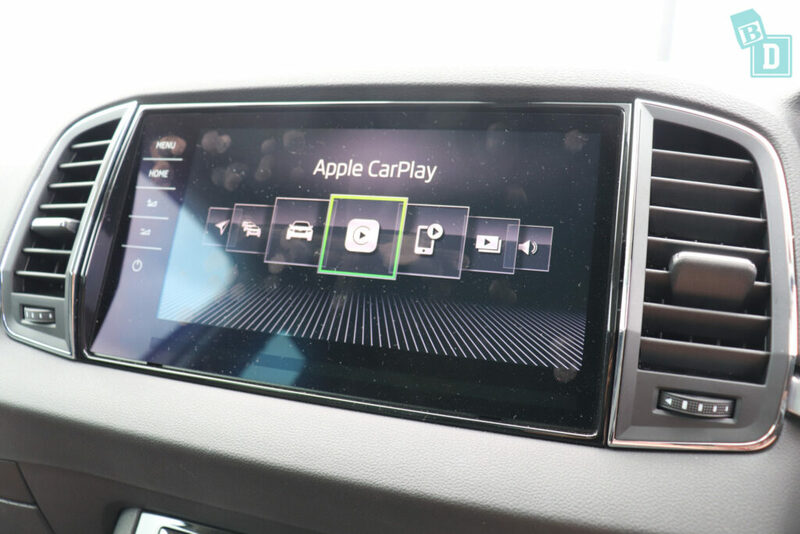 It is really easy to navigate and quick and simple to connect your phone to and it has Apple CarPlay and Android Auto. I found it played the nursery rhymes that were playing on my phone as soon as I connect my phone to the car, which I find helps to keep my girl calm. 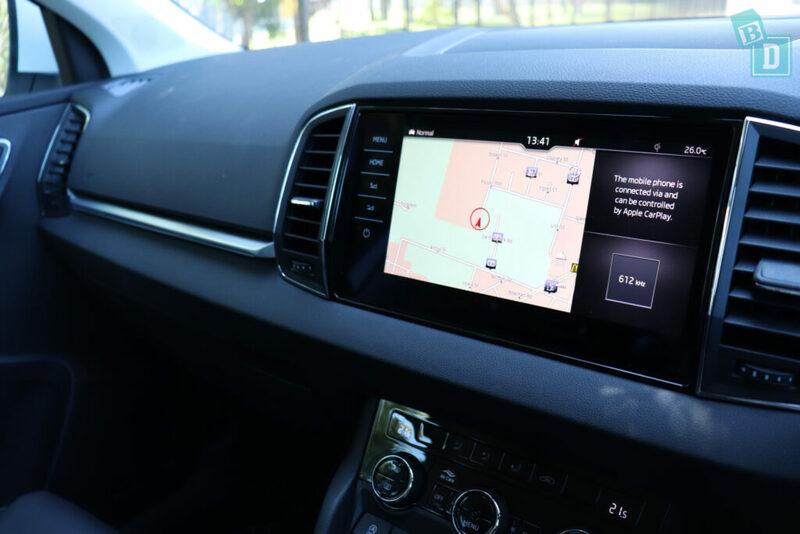 The sat-nav in the Karoq is really simple to use, with a lovely big, clear map and screen. You can mute the sat-nav voice easily too pressing a button on the bottom right of the media screen, which was nice and simple. 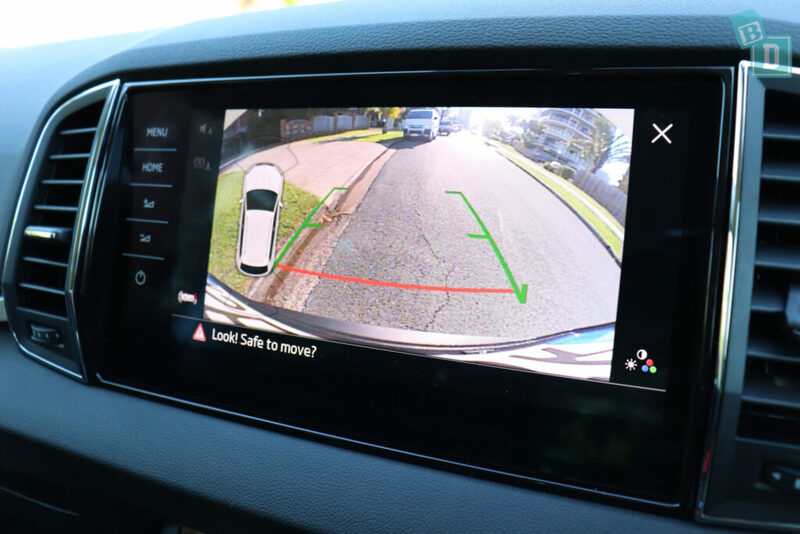 There is no lane departure warning in the Skoda Karoq. 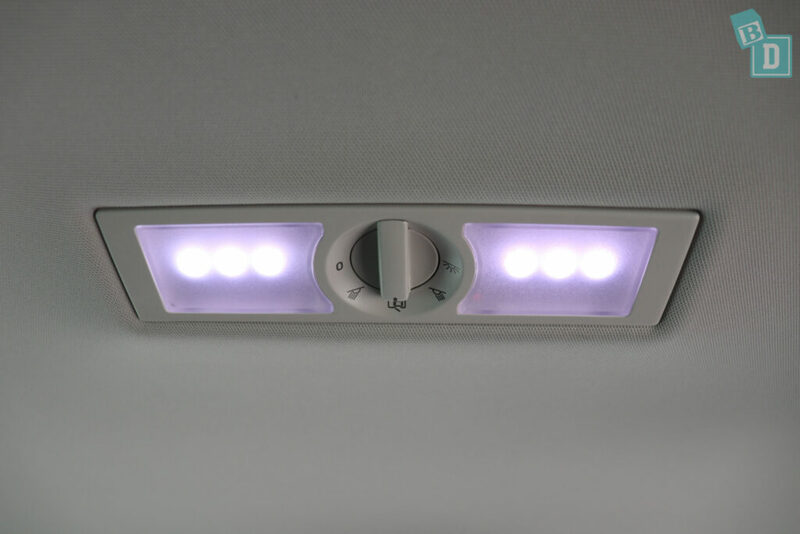 The indicators have a loud ticking sound, that when stopped, with a sleeping baby onboard they could disturb it. 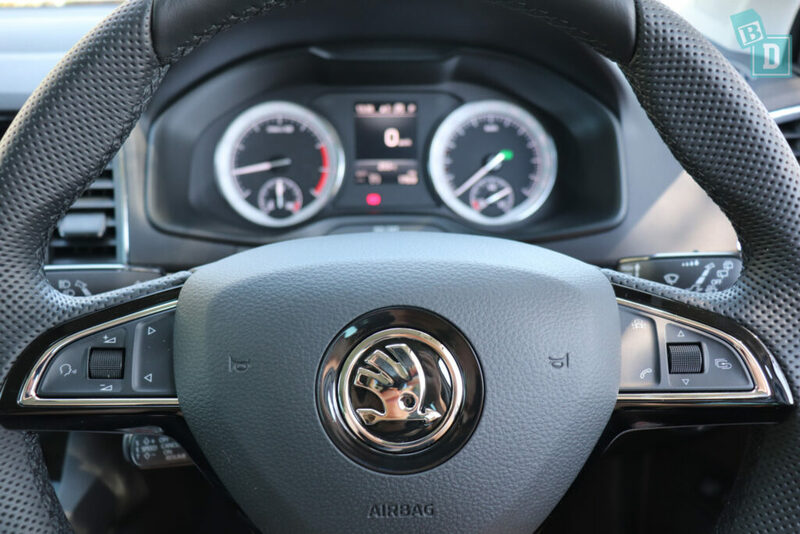 The cruise control is on a stick, on the left, behind the steering wheel, so it is not the easiest system to operate but the cruise control is very effective at holding the chosen speed, unlike far too many other cars I have driven! 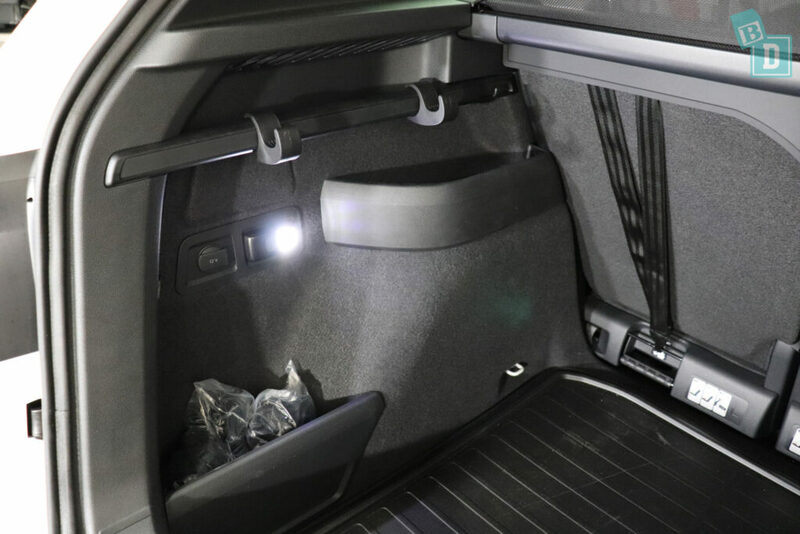 The doors of the Karoq are quite loud to close but open softly so you have to be careful if you have a bub asleep in the back and you get in or out. The windows also close with a bit of a thud and the windows have quite a loud mechanism sound. I found you can come to a stop with the engine still running and get out of the car without sounding any alarms. I have found the door locks rather irritating in the Karoq, they seem to lock automatically and then you need to press the padlock button on the dash about three times to get all the doors to unlock. If seatbelts are undone during a drive an alarm sounds and a visual is displayed in the screen in front of the steering wheel. 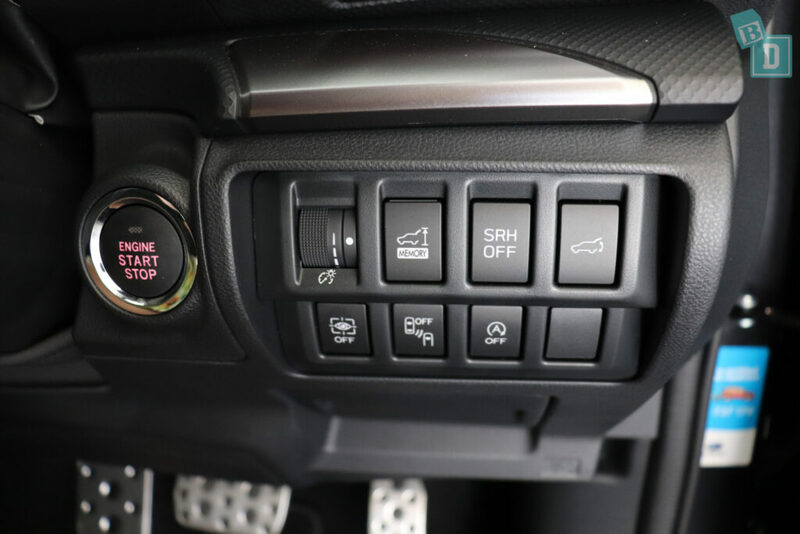 The auto engine cut-out button is by your right knee, to stop the engine turning on and off at lights and junctions when you come to a stop. The seatbelt removal alarm makes a ‘gling, gling' sound and a light alerts you on the dashboard too. 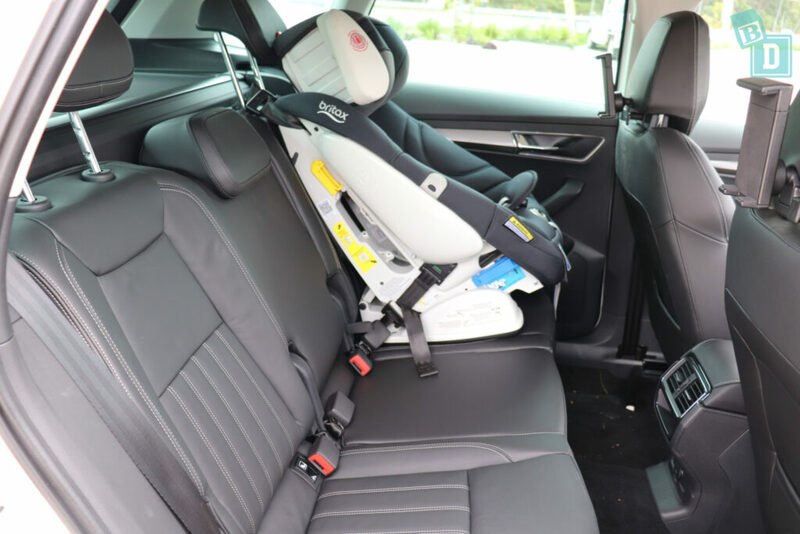 How many child seats fit on the Skoda Karoq? Two, I found there just wasn't enough room in the rear of the Karoq for a third child seat. 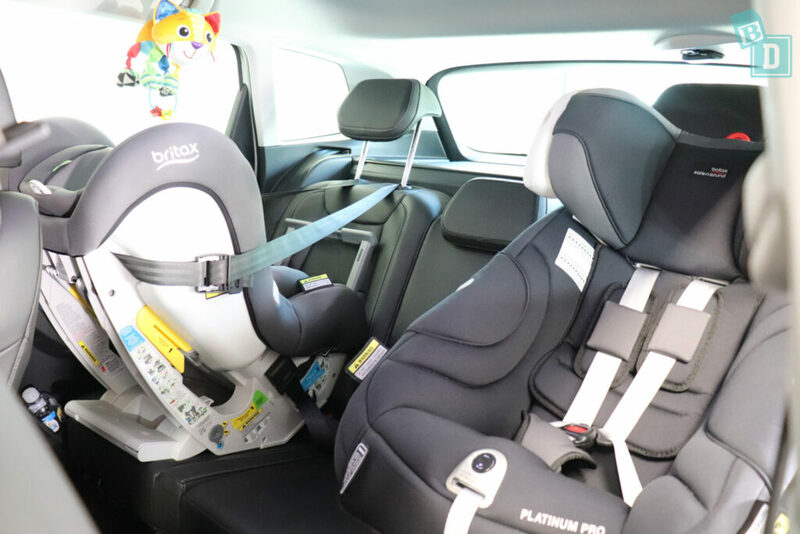 I installed the rear-facing Britax Graphene and the forward facing Britax Platinum Pro, both in the outer seats using IsoFix and top tethers. 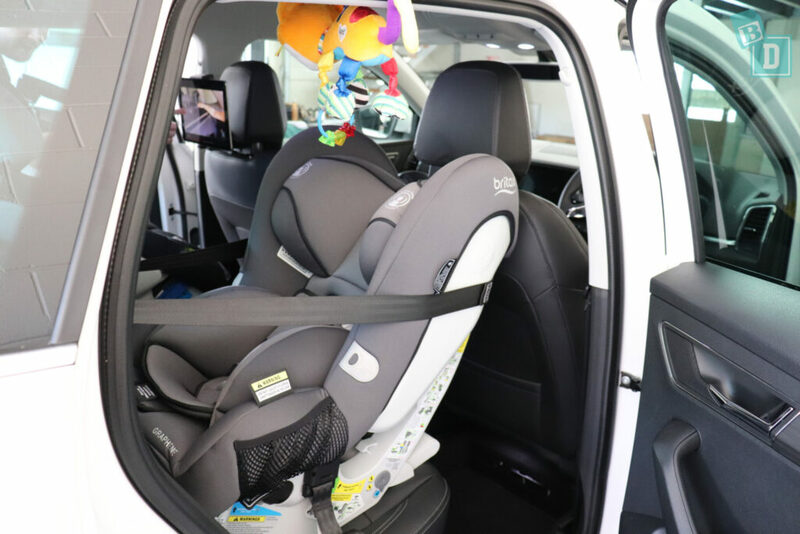 While the child seats were nice and easy to install, I did notice the outer rear headrests were not removable and I know this is important when installing some child seats. 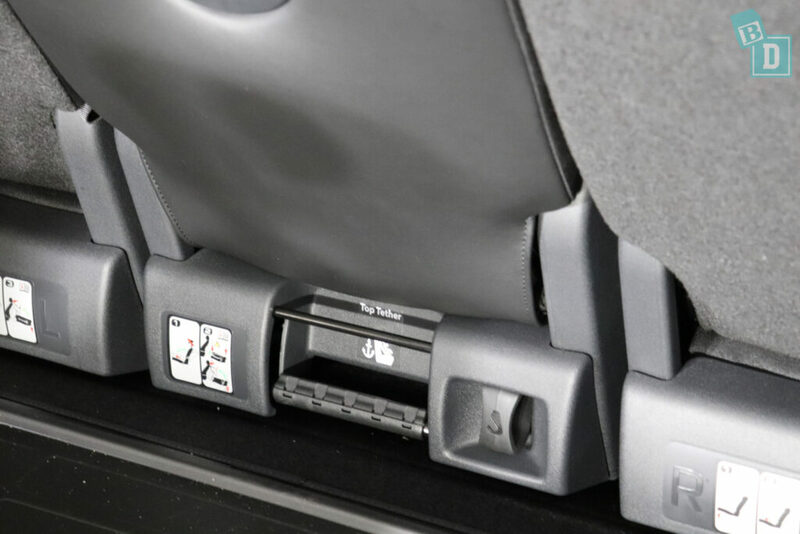 The IsoFix points are within plastic guides and are really nice and easy to connect to. 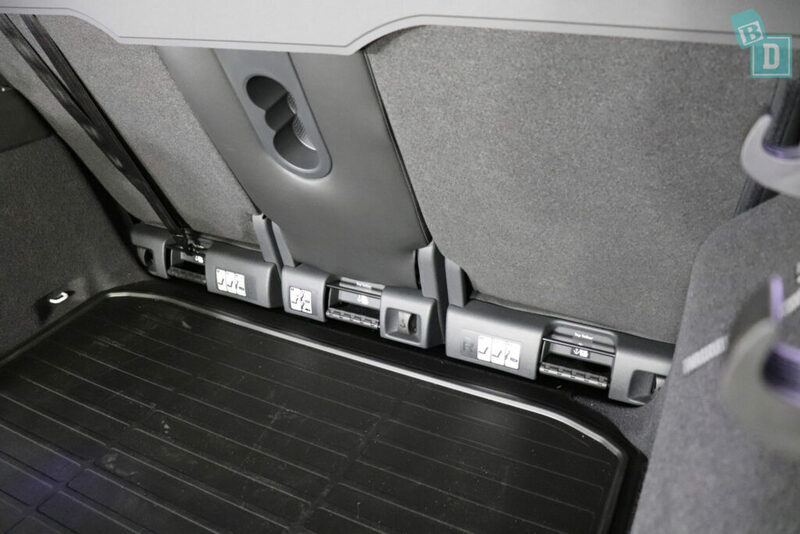 The three top tethers are right at the bottom of the seatbacks at the back and easily accessible through the boot. They are the black metal bar at the top of this elaborate seat folding mechanism, I just hope nobody clips their top tether hooks onto the black plastic one at the bottom. 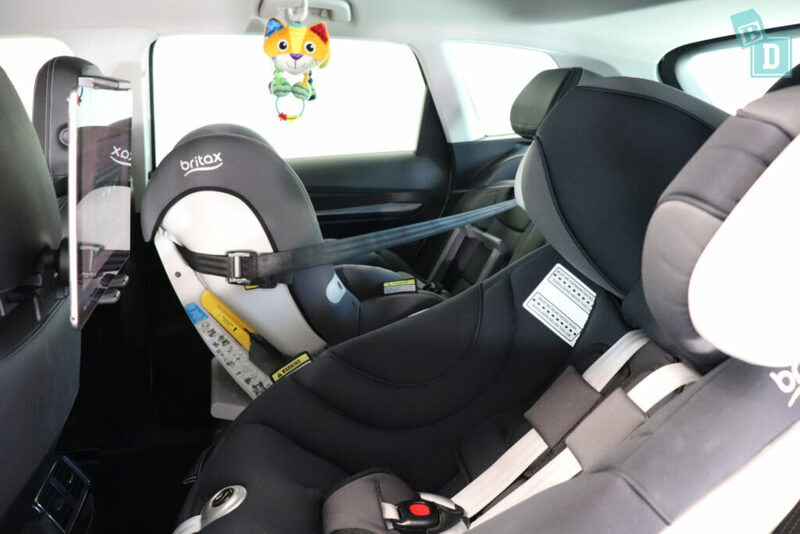 Posting bub into their child seat from outside the car is really nice and easy in the Karoq; there is a good amount of space in the doorway to post them through. There is room to feed bub in the back if you only have one child seat installed. The seats are upholstered with leather and would wipe clean. How comfortable is the Skoda Karoq? 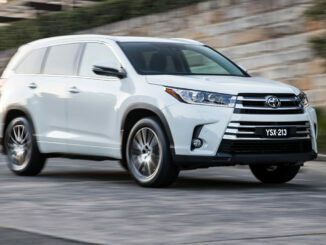 In the front of the Karoq, the driver's seat was generally comfortable and is manually adjustable. I found that the seat base tipped up at the front, so if I raised the seat base then I couldn't reach the pedals! (I'm 162cm) so I did have to keep the seat base quite low which meant the wing mirror and front, side pillar caused quite a blind-spot for me when I was driving. I found I couldn't have a ponytail in the front seats because the headrests were not adjustable or at a good angle to allow for it! 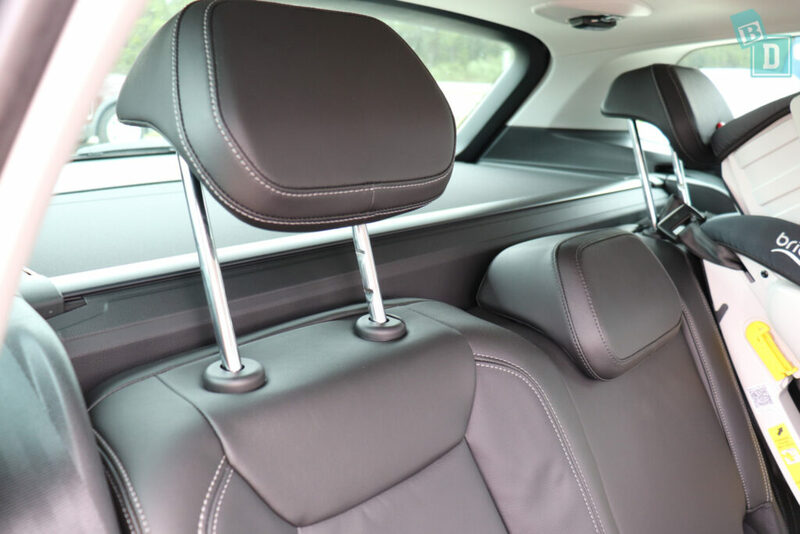 The seats in the front and rear of the Karoq are plain black leather with a few rows of stitching which is great for being able to wipe clean easily. 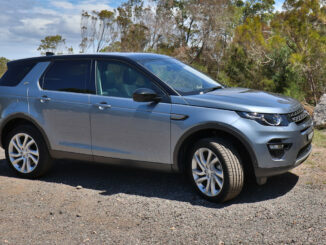 For a mum travelling in the back with bub, the seats are comfortable and there is ample headroom. In the central seat, your feet do have to straddle a small hump in the footwell. 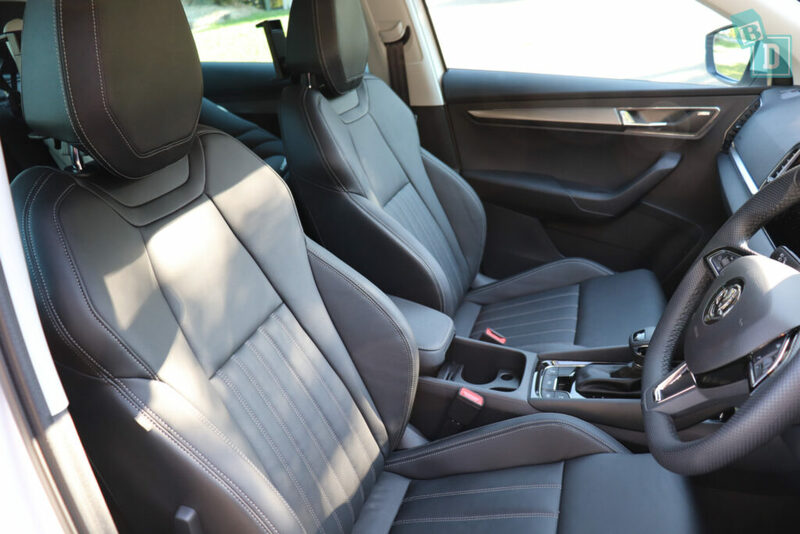 The rear seats are comfortable but you can feel the hard central backrest because of the fold-down armrest and cup holders in the central seat back. The cruise control is on a stalk behind the steering wheel on the left. I found it very accurate but a little difficult to use. 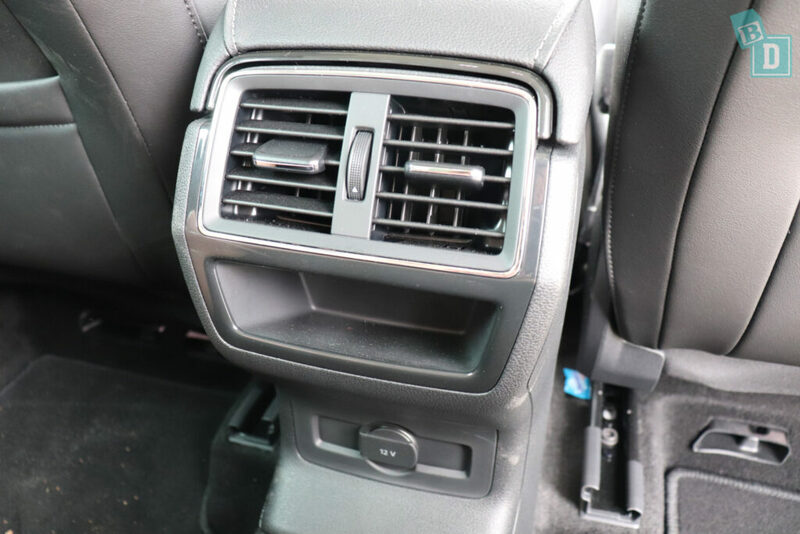 There are rear air vents in the back of the central console box that are reachable from the front while driving and a 12V socket for rear passengers. 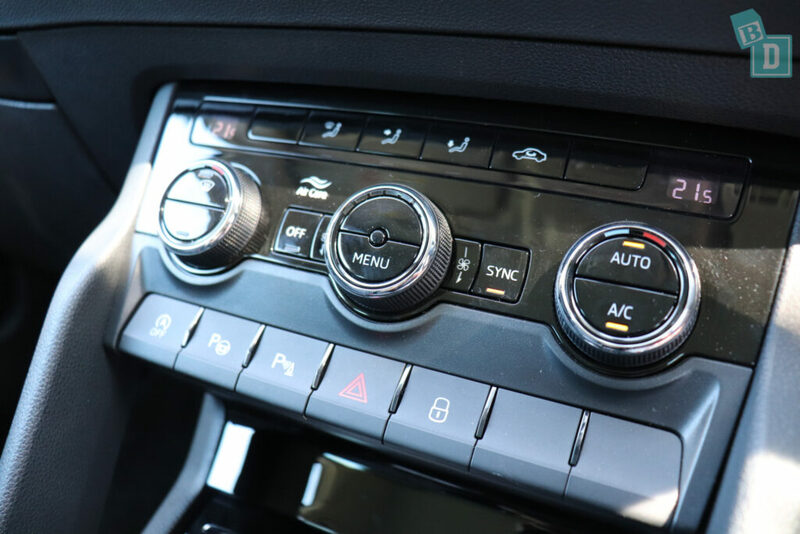 The controls for the aircon are three dials on the central dashboard, which I found nice and easy to locate and use whilst driving. The airflow in the Karoq is really nice and subtle and cools the cab without a loud blowing sound or feeling. The interior lights in the rear are in the ceiling centrally about halfway back and I found I could just reach them while I was driving! There are lit vanity mirrors in both from visors and there is a glasses case in the ceiling too. 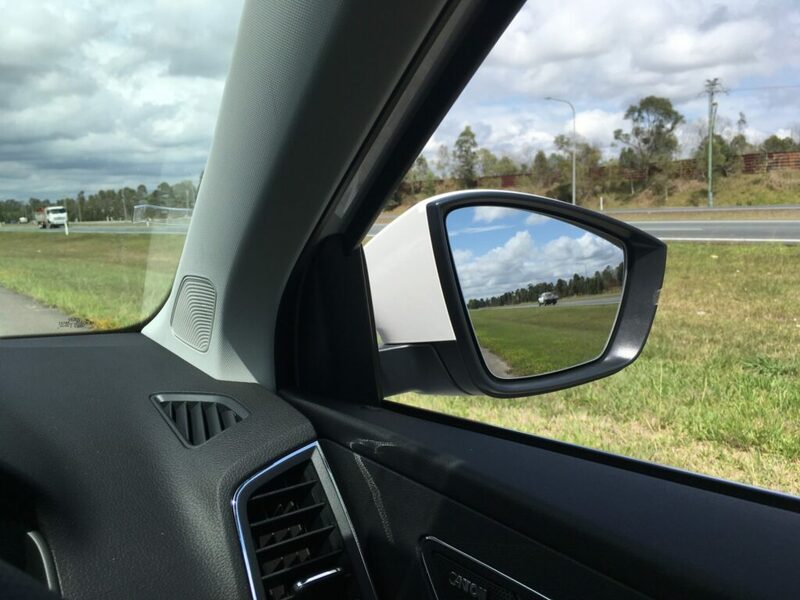 Visibility in the Karoq is quite good for the driver, but the windows do slope up slightly in the back which always affects vision for the driver and for rear-facing passengers. One thing I have noticed since being a mum is I hate it when I reach a destination or get home from being out and Tulsi has either done really well in the car or she is screaming her head off and I have done really well to keep it together for the entire journey (usually the latter!!) and it takes 10 minutes to park the car! It can be really stressful. Usually I dread parking new cars as they take longer in our tight apartment block carpark, but the Karoq was okay to park, the visibility was okay and camera and park pilot were excellent! 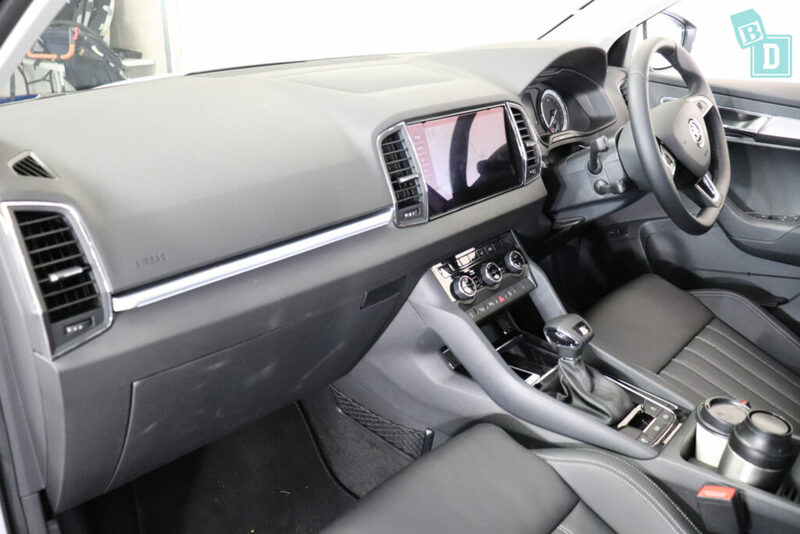 The Skoda Karoq does have a nice, modern interior with a quality feel, that would be easily cleaned and all dash and door surfaces are black rubber, leather or plastic. 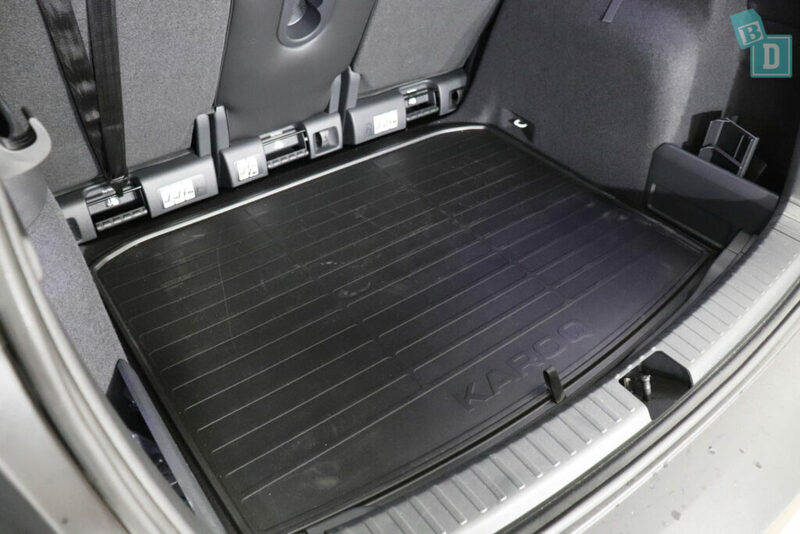 There are carpet floor mats throughout the Karoq and a rubber mat in the boot floor. The Karoq is a great drive, very smooth, quiet and filled you with confidence in the capability of the car on bends and in the wet as well as just being comfortable around town. The Skoda Karoq has keyless entry and a powered tailgate. 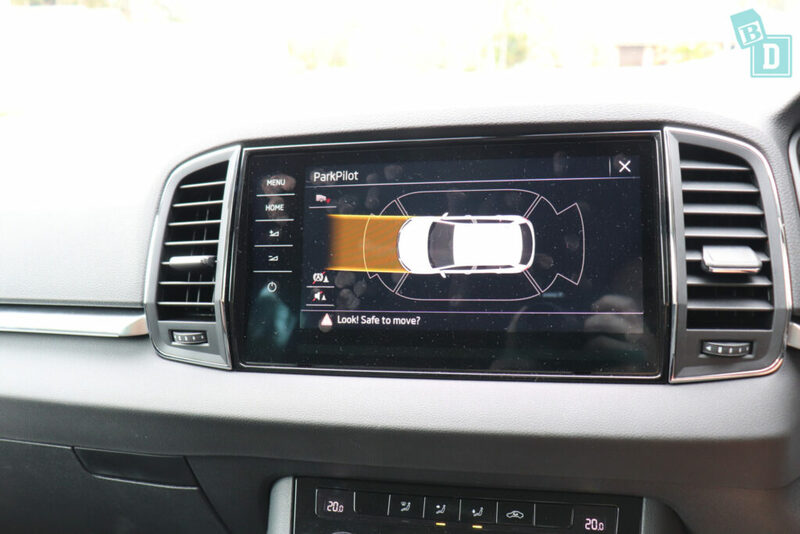 How safe is the Skoda Karoq? ANCAP is yet to test the Skoda Karoq, but it did score a five-star Euro NCAP safety rating in 2017. For child occupancy, it scored 79%, for adult occupancy it scored 93% and for pedestrians 73%. As standard all models of the Skoda Karoq come with front assist with city emergency brake, electronic stability control (ESC) (incl. hill hold control), Anti-lock braking system (ABS), anti-slip regulation (ASR), electronic differential lock (EDL), hydraulic brake assist (HBA), adaptive cruise control (ACC), driver steering recommendation (DSR), rain braking system (RBS), multi-collision braking (MKB), manoeuvre breaking assist, emergency fuel supply cut-off, automatic flashing brake lights activated in emergency braking situation, electric engine immobiliser, tyre pressure monitoring system, driver fatigue detection and activation of warning lights on impact. 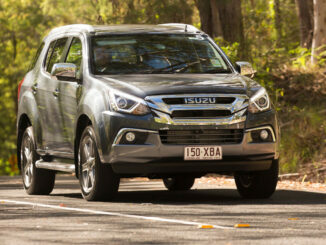 Additional safety features lane keep assist (LKA) and blind spot monitoring (BSM) are both available in an extra package.